Deep venous thrombosis has been a problem in adult trauma patients for some time. Turns out, it’s a problem in injured children as well although much less common (<1%). However, the subset of kids admitted to the ICU for trauma have a much higher rate if not given prophylaxis (approx. 6%). Most trauma centers have protocols for chemical prophylaxis of adult patients, but not many have similar protocols for children. After the protocol was used, all DVT was detected via screening. Suspicion based on clinical findings (edema, pain) only occurred pre-implementation. Bottom line: DVT does occur in injured children, particularly in severely injured ones who require admission to the ICU. Implementation of a regimented system of monitoring and prophylaxis decreases the overall DVT rate and standardizes care in this group of patients. This is another example of how the use of a well thought out protocol can benefit our patients and provide a more uniform way of managing them. Does central line insertion promote DVT? Does interrupting DVT prophylaxis increase risk? Does pulmonary embolism really arise from DVT? 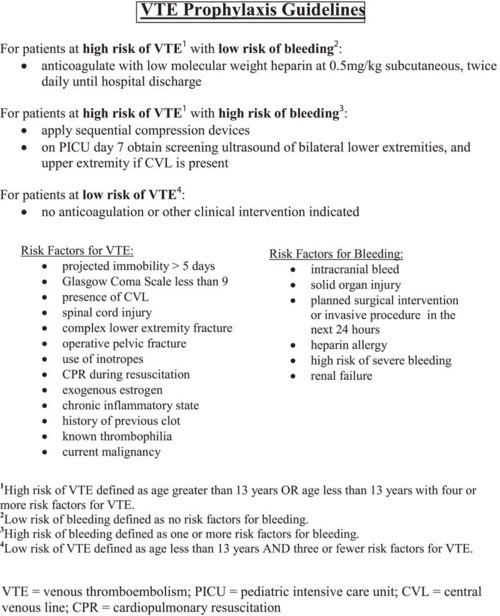 Reference: Effectiveness of clinical guidelines for deep vein thrombosis prophylaxis in reducing the incidence of venous thromboembolism in critically ill children after trauma. J Trauma 72(5):1292-1297, 2012.